It can take a little while to get to know a new device, and the iPad Pro is no exception. But after more than a week of use, I've started to see its really important features – not just the headline ones, but those that make a difference every day. It's difficult to describe in words quite how good the iPad Pro's speakers are. They're not just good “for a tablet” – they're good, full-stop. 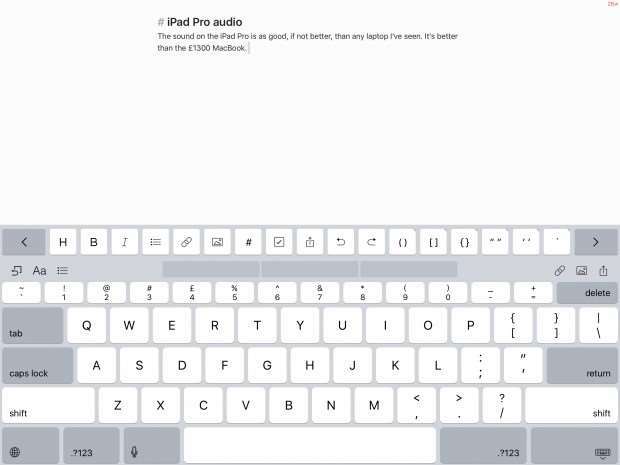 Apple has clearly spent a lot of time and effort on making the iPad Pro sound really good. How has Apple managed this from a such a thin device? According to iFixit's teardown of the iPad Pro, it's mostly down to some big speaker enclosures. There are four speakers in the tablet. If you combine the area that the enclosures take, it's about half the space that's devoted to the battery. That's a lot of space in something this size. Apple could have put in smaller speakers, but that would have sacrificed sound quality while adding more weight. On the plus side, you would have got more battery life, but given that the iPad Pro has pretty decent battery life anyway, it's worth the trade-off. Once you've had a tablet with built-in LTE, going back to tethering to a phone when you're out of wi-fi range feels like a step back into the dark ages. Yes, you have to pay for an additional mobile SIM – but that's a price worth paying when it means you can get online virtually everywhere. Up until now, all the models of iPad have had an LTE option, but Apple has changed tack with the iPad Pro and you'll need to buy the top of the range 128GB model. It's a bit of a shame, but at least the option is there. Why don't all tablet manufacturers do this? A physical keyboard is nice but it's not always the best option, and I suspect most people will end up using the iPad Pro with the onscreen keyboard quite often. It's great news that it has been massively improved, so you now have a row of numbers, bigger shift and caps lock keys – and more. The spacing on the keys is also excellent, which makes it easy to type on. There are so many things about the Pencil that Apple has got just right. The weight. The feel in the hand. The way that strokes appear on screen. If you've got any creative bones in your body, you'll enjoy it. But the thing we use it most for? Writing notes. Having a big screen to write notes on rather than having to have the keyboard open and stare at the screen while in meetings makes a lot of difference to how much you engage with what's going on around you. One final thing we love: when you roll the the Pencil across the resk it always comes to rest with "Pencil" on top. If Apple wanted a cheesy advertising slogan to promote its latest iPad, “nothing is slow on the iPad Pro” would be in with a shout (Apple, if you'd like to license it, we're happy to do so for a small fee). Want to export 4K video from iMovie? Sure, go right ahead! Games? No game yet made is enough to stretch it or make it stutter.